During the late 1420s, just as the Santa María and Carvajal families were gathering their collective power in the city of Plasencia, the Señor de Oropesa (the Álvarez de Toledo family) and the Señor de Valverde (the Niño family) coordinated an attack them. These Señores challenged the traditionally recognized jurisdiction of the city council over its neighboring villages. What ensued was a fierce regional conflict over natural resources (grazing, fishing, and agricultural rights) and secular leadership in the region. At stake was whether or not the two Señores could extend their authority over territories traditionally controlled and taxed by the city and Cathedral of Plasencia. Figure 1: The Geographical Focus of the 1431 Royal Investigation. Map by Roger L. Martinez-Davila. In December of 1431, Judge Miguel Sánchez assembled the city council of Plasencia, along with representatives from neighboring villages, to oversee a judicial investigation into a conflict between the city of Plasencia and several local lords over property rights near and around Jarandilla. Among those participating from the city council were Caballero (Knight) Diego González de Carvajal, Alfonso Fernández de Cabreros (a Santa María clansman) and his son by the same name, and their familial ally, Alfonso Fernández de Logroño. The four men enjoyed a collaborative relationship, which they employed previously to direct many of the council’s actions. For instance, just three years earlier, the four corregidores and their relatives inside the cathedral of Plasencia had overseen the city council and cathedral’s initiative to share royal transit tax collections (the portazgo). Also gathered for the hearings, which were held in the Church of St. Vincent, were residents from the neighboring communities of Losar, Arroyo Molinos, Jarahiz, Cuacos, Aldeanueva de la Vera, Jerete, Navaconcejo, Ojalvo, Esperilla, Gargantilla, Segura, and Tornavacas. Notably absent from the meeting were García Álvarez de Toledo (theSeñor de Oropesa) and Pedro Niño (the Señor de Valverde) whose own interests ran counter to those from Plasencia and most other local communities. In particular, theSeñor de Oropesa and the Señor de Valverde were particularly power as they ruled their sub-regions of the Extremadura as the ultimately secular authorities. In essence, if they could extend their political authority to new lands, and at the expense of the City and Cathedral of Plasencia, then they could benefit in the form of collecting additional taxes. At the heart of the conflict, according to Judge Miguel Sánchez, was whether or not García Álvarez de Toledo had ordered the residents of Jarandilla to take anyone prisoner for the crime of fishing, tending cattle, or farming in the disputed lands. Although King Enrique II had donated the villages of Jarandilla and Tornavacas to García Álvarez’s father, Fernán Álvarez de Toledo (d. 1398), the territory surrounding these villages was not within the jurisdiction of the Senores de Oropesa. To a lesser extent, the judge was also interested in Pedro Niño’s efforts to appropriate lands near the village of Valverde. Embedded in Miguel Sánchez’s royal charge was only a hint of the deterioration of societal affairs in the region surrounding Plasencia, which the local lords and Plasencia’s leaders could not resolve. Indeed, in the years prior to the inquest, there was a significant increase in violence against persons and property in the kingdom as a result of convoluted property and jurisdictional conflicts involving the monarch, noble families, and churches. It is telling, for example, that three of the ascending members of the Carvajal clan received papal absolutions for their participation in violent clashes in the village of Trujillo and the surrounding region. In 1427, the Holy See granted Rodrigo de Carvajal, who would become the Archdeacon of Plasencia and Béjar in the 1440s, and his cousin, Alvaro, “absolution of censure for…their armed intervention” in a conflict that left many persons in the village of Trujillo injured or dead. Two years later (March 1429), the pope granted Juan de Carvajal, the brother of Rodrigo and the future Bishop of Plasencia, a more extensive papal dispensation for his participation in a “quarrel that resulted in bloodshed.” Juan’s crimes were so problematic to his advancement in the church that Pope Martín V absolved the churchman of “all irregularities and infamy” that would prevent him from acquiring a religious benefice. Five months after receiving his papal dispensation Juan was able to assume a canon’s position in the Cathedral of Palencia, which is located to the northeast of Plasencia. Thus, it appears that the ecclesiastical relief that Juan and his brothers sought from the Roman Catholic Church was not linked to an isolated affair, but rather multiple regional disagreements, which ultimately required the intervention of an outside royal judge. I have placed my trust in Miguel Sánchez de Sepúlveda, Bachiller of Law…to conduct an investigation regarding any items—all of them—including…pleas, …allegations …and thefts. And for half a year Miguel Sánchez can suspend the offices and powers of my local mayors and judges [to pursue this investigation]. Thus, the king’s decision to grant the judge this breadth of power reveals that local noble families lacked sufficient political sway to resolve these regional conflicts and enforce peace in the greater diocese. It further suggests that King Juan II believed he needed to subjugate all local secular powers in the region to his supreme authority. Only in this manner could the judge resolve the conflicts. This circumstance was almost certainly due to the nature of Castile’s overlapping secular and ecclesiastical jurisdictions. Because the Señor de Oropesa and Señor de Valverde were the king’s vassals, only the monarch could hold them to account in secular affairs. These señoreshad explicitly demonstrated through their actions that they believed the city council of Plasencia lacked any authority to impose its decisions and mandates on territories considered outside its periphery (termino). In particular, the Señor de Oropesa appeared willing to test the limits of his jurisdictional authority outside of the villages of Jarandilla and Tornavacas. A critical focus of the judge’s investigation and findings would center on the extent of Plasencia’s periphery, particularly the area to the east of the city. As all of the claimants framed the conflict as a secular matter, and not as a church issue, the local church leaders were unable to harness the authority of the cathedral of Plasencia to resolve the matter in their favor. If the issue were ecclesiastical in nature, then Bishop Santa María and the cathedral’s church chapter could claim jurisdiction over all lands west of the Cathedral of Ávila and the Monastery of Guadalupe. However, the jurisdictional conflict did not pertain to church properties or the payment of church taxes and therefore the local Carvajal-Santa María family confederation could not exercise the church’s power in the matter. Thus, to ensure that Judge Miguel Sánchez had sufficient authority to enforce an agreement among the parties, the king empowered him with absolute secular authority over all parties. 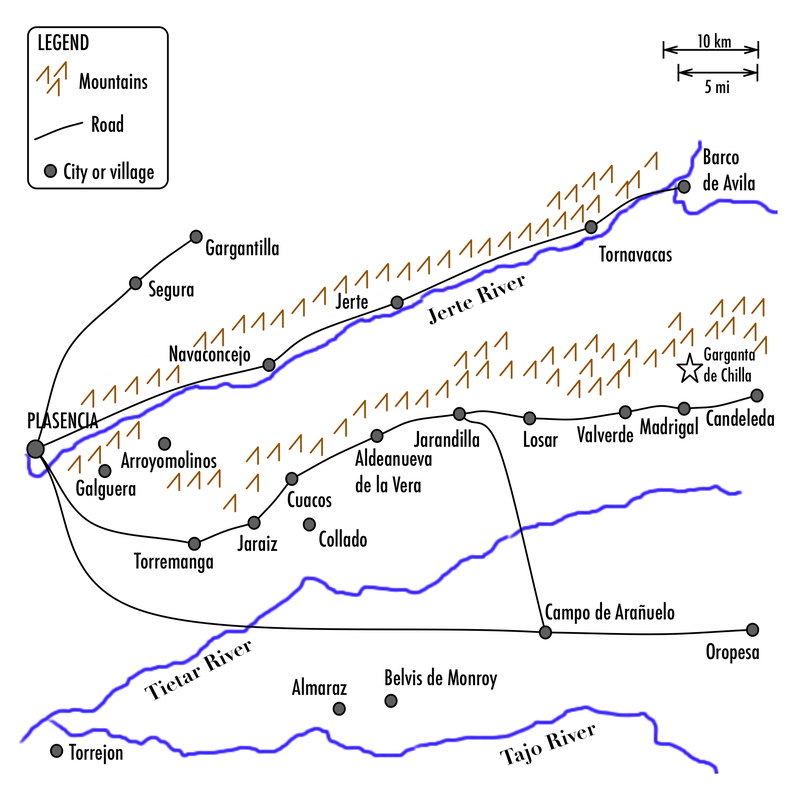 (1) Did they occupy and take possession of the disputed lands belonging to the city council of Plasencia? (2) Did they pay the city council for these lands? (3) Had they taken anyone prisoner? (4) Had they erected a hangman’s gallows in the disputed lands? (5) Did they do any of these things with the help of García Álvarez de Toledo? Judge Miguel Sánchez’s questions quickly revealed critical facts about Jarandillans’ activities as well as the obstinance of García Álvarez de Toledo and Jarandilla’s village council. Not only did García Álvarez fail to present himself at the hearing, but the only men from Jarandilla compelled to attend the inquiry were Juan Sánchez de Castillo, Pedro Fernández, and Diego Gómez, none of whom held any official position on their local council. With each response that these men provided to the judge’s questions, the inquiry verified that García Álvarez had claimed the disputed properties as his own seigniorial lands. Further, García Álvarez had ordered the residents of Jarandilla, who were his vassals, to enforce a fishing and herding ban in nearby areas, thereby disturbing the traditional “peace and coexistence” of the local communities. Thus, if García Álvarez and the residents of Jarandilla could effectively expand the generally accepted boundaries of the village of Jarandilla, then both parties could claim new income-producing resources as their own. In effect, García Álvarez and Jarandillans were attempting to redraw the extra-territorial jurisdiction of the city of Plasencia. The men from Jarandilla also explained to Judge Sánchez that events took a turn for the worse when their local village council, “claimed all of the surrounding land around Jarandilla as a part of their jurisdiction and erected a hanging gallows.” As the line of questioning proceeded, these men also noted that some of their unnamed neighbors had taken three local pastoralists from the village of Losar, as well as Rabbi Abraham de Loya of Plasencia, hostage and had transported all of them to García Álvarez’s village of Oropesa. 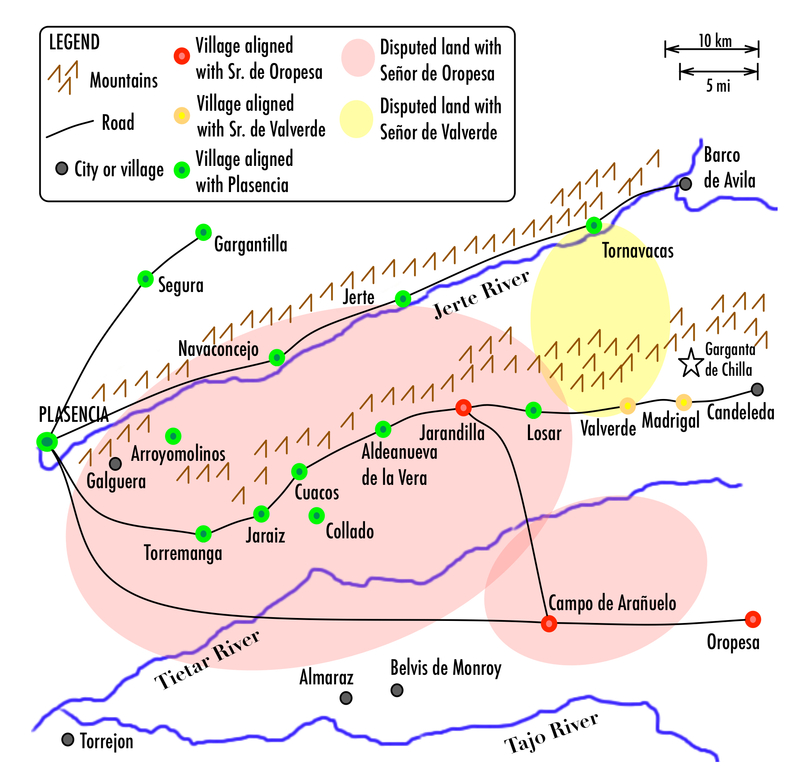 Cumulatively, these findings demonstrated that the Señor de Oropesa had aggressively pursued his claims to these lands through his proxies in Jarandilla, who willingly used physical force, intimidation, detentions and fines, as well as the threat of hanging against anyone that trespassed into these disputed areas. The testimony from the men of Jarandilla also exposed the limits of what Judge Miguel Sánchez could accomplish in the case. He was ultimately unable to force the men to name any member of the group that had taken hostages. Moreover, the absence of García Álvarez, or any his personal representatives, from the proceedings highlights how little power the king had to compel the Señor de Oropesa to appear and address the parties’ claims in this specific investigation. Although García Álvarez did not attend the hearing, Judge Miguel Sánchez’s questions revealed that he believed the city council of Plasencia was the proper local authority and owner of the disputed lands. (See Figure 2.) By framing the question, “did the residents occupy and take possession of the disputed lands belonging to the city council of Plasencia,” he explicitly accepted the Placentino’s claims. 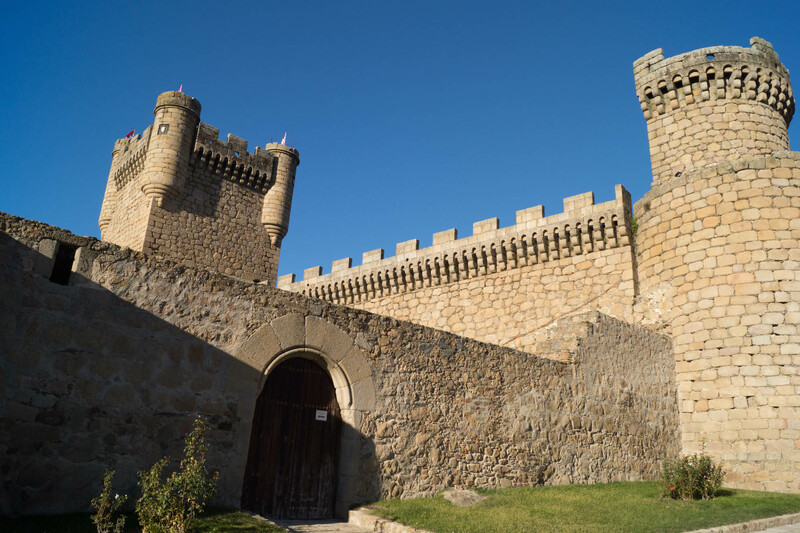 The judge was on solid legal ground because the Fuero de Plasencia, the royal document establishing the rights and privileges of the city of Plasencia, granted the lands in question to the city. Judge Miguel Sánchez’s direct questioning of the residents of the village of Losar established the customarily acknowledged eastern periphery of the city. These lines were explicitly marked with boundary stones (mojones). The eastern reaches of the periphery abutted Pedro de Estúñiga’s secular lordship of Barco de Ávila and Pedro Niño’s ownership of the villages of Valverde and Madrigal. However, according to the residents of Losar, the land situated in between these two seigniorial lands, which was close to Garganta de Chilla. Figure 2: Competing Jurisdictional and Ownership Claims. Map by Roger L. Martinez-Davila. By securing this testimony, which occurred under the approving eyes of the Carvajal-Santa María-dominated city council of Plasencia and in the venue friendly to these clans (the Church of St. Vincent), Judge Miguel Sánchez established the furthest eastern boundary of Plasencia (between Barco de Ávila and Candeleda). The findings were damning, as they demonstrated that Pedro Niño (Señor de Valverde) had encroached into Plasencia-owned lands close to the village of Losar and north toward the village of Tornavacas and the River Jerte. Curiously, although the Señor de Oropesa owned Tornavacas, it was the Señor de Valverde who contested the city of Plasencia’s rights in this region. It seems likely that García Álvarez offered Pedro Niño something of value, perhaps control or use of his lands in Tornavacas, in return for his assistance with contesting Plasencia’s jurisdiction. Additional testimony highlighted the accepted southeastern boundaries of the jurisdiction of Plasencia. Specifically, witnesses indicated that an unknown party had tampered with and removed boundary stones demarking the city council of Plasencia’s southeastern periphery near Campo de Arañuelo—a village that was under the lordship of García Álvarez (Señor de Oropesa). These witnesses definitively noted that although the Señor de Oropesa rightfully claimed the village of Jarandilla as his own secular jurisdiction, all of the territories surrounding this village fell within the city of Plasencia’s authority. Thus, with the exception of Jarandilla, all of the Señor de Oropesa’s seigniorial lands fell south of the Tietar River. The judicial process also exposed the unwarranted seizure of cattle and prisoners in and around Jarandilla, as well as in around other villages immediately adjacent to Plasencia, such as the village of Galguera. In sum, Judge Miguel Sánchez utilized this judicial method to map the physical topography, including referencing mountains, pastures, and valleys, in order to clarify and validate the jurisdictional claims of the city of Plasencia. In addition to reinforcing the physical boundaries of the city of Plasencia, the inquiry also revealed Plasencia’s relationship with other local communities. The judge’s inquest confirmed that the villages and inhabitants of Arroyo Molinos, Torremanga, Jaraiz, Collado, Cuacos, Aldeanueva de la Vera, Losar, Jerte, and Navaconcejo perceived themselves to be within the secular jurisdiction of the city council of Plasencia. As such, these residents likely expected Plasencia to protect them from malfeasance and the predatory behavior of the Señor de Oropesa and Señor de Valverde. Interestingly, although the residents of the village of Tornavacas were a part of theSeñor de Oropesa’s seigniorial jurisdiction, they too claimed to be outside the authority of García Álvarez. The judicial process also exposed the willingness of local communities to use the royal legal process to pursue the redress of wrongs against them. For example, several men from Aldeanueva de la Vera, Cuacos, and Tornavacas readily confirmed that, “García Álvarez ordered that no one was to fish from the Jerete River in that area,” and that the señor had taken many local residents prisoner. Others, like the Sánchez family of sheepherders, added that the Señor de Oropesa incarcerated these residents, as well as other “poor men”, until their families paid “great quantities of maravedis”. The conflict extended to lower nobles, like Martín Fernández de Toledo, when men took his herdsmen with their “hands bound” to Jarandilla and confiscated his cattle. By presenting their claims to Judge Miguel Sánchez, it appears that these and other parties hoped to recoup lost assets and the unfair imposition of ransoms for hostages. Perhaps those most unable to protect and defend themselves during this regional conflict were the Jewish residents of Plasencia. During the investigation, several imprisoned residents of Jaraiz confirmed that men from Jarandilla had not only taken Rabbi Abraham de Loya captive, but that he was singled out for harsher treatment when his hands were not bound, but instead “shackled in chains”. The group of prisoners noted that their captors later transported the rabbi to their village of Jarandilla and held him captive for an extended period of time in an isolated house in the mountains. Although the rabbi appeared to survive the disturbing and demeaning ordeal, two of his coreligionists were not as fortunate. The sheepherders Juan and Pascual Sánchez of Tornavacas reported they had seen men transporting the “bodies of Fartalo and his wife”, both Jews from Plasencia, to the village of Oropesa. Although no one could elaborate on the circumstances of their deaths, it is possible that they were victims of Jarandilla’s gallows. Although local Christians suffered the temporary loss of liberty, monies, and assets during this conflict, the judge’s inquiry revealed that no Christian lost his or her life during these events. The death of the two Jewish residents of Plasencia, and the lack of additional questioning on the matter by Judge Miguel Sánchez, revealed that Plasencia’s Jews lived a precarious existence in a society that targeted them for harsh punishment and sometimes murder. Although the archival record does not preserve the final ruling of Judge Miguel Sánchez de Sepúlveda, the thrust of his investigation demonstrated his willingness to support the claims of the municipal council of Plasencia over the assertions of regional lords. It was a position that was more favorable to the king because he ultimately controlled city councils, which served as valuable royal counterbalances to independent-minded seigniorial lords. Fortunately for the Carvajal and Santa María clans, whose members served as the monarch’s counselors and on his city council in Plasencia, this arrangement also benefited the two families’ efforts to fortify their own political and economic positions in Plasencia. Cumulatively, the royal inquest of 1431 demonstrated that liberty and livelihood in Plasencia was dependent on a complex interaction of political, economic, and religious factors. The nature of the investigation revealed that the Kingdom of Castile and Leon existed as a patchwork of royal, municipal, religious, and seigniorial jurisdictions. When local city councils and local lords could not agree on how to balance the needs of these jurisdictions, the king’s supreme authority was required to settle disputes. In particular, Christian commoners and religious minorities such as Jews often found themselves trapped in the mechanics of these conflicts. Although the Carvajal-Santa María confederation would effectively clear this jurisdictional hurdle in 1431, they would soon encounter an even more problematic situation and challenge to their local authority. The Señor de Oropesa and Señor de Valverde had proved worthy adversaries of the confederated families, but they would be insignificant in comparison to the Estúñiga family, who the king made the Condes de Plasencia in 1441. As the “Counts of Plasencia”, the Estúñiga family became the supreme secular leader in region. Archivo de la Catedral de Plasencia (ACP) Legajo 282, Documento “El Portazgo de Plasencia pertencia al Cabildo Catedral…”; ACP Legajo 270, Documento 15. Jose Manuel Gutiérrez Rodríguez et. al., Oropesa y Los Álvarez de Toledo (Toledo: Diputación Provincial, 1985), 17. Paredes y Guillén, Los Zúnigas, Señores de Plasencia, 69, note I.
 Vicente Beltran de Heredia, Bulario de la Universidad de Salamanca (1219-1549), Volumen II (Salamanca: Universidad de Salamanca, 1966), 302-303; Archivum Secretum Apostolicum Vaticanum (Vatican Secret Archives ) Reg. Suppl. 213, Folio 19. Beltran de Heredia, Bulario de la Universidad de Salamanca (1219-1549), Volumen II: 329-330; Archivum Secretum Apostolicum Vaticanum (Vatican Secret Archives ) Reg. Suppl. 244, Folio 250. Beltran de Heredia, Bulario de la Universidad de Salamanca (1219-1549), Volumen II, 332; Archivum Secretum Apostolicum Vaticanum (Vatican Secret Archives ) Reg. Suppl. 244, Folios 19v-20. ACP Legajo 282, Documento 7. Alfonso Franco Silva, “Oropesa: El Nacimiento de un Señorio Toledano a Fines del Siglo XIV,” Anuario de Estudios Medievales, Vol. 15 (1985): 309. AMP Sin Legajo. “Pesquisa hecha por Miguel de Sepúlveda corregidor de la ciudad de Plasencia, en razon de las terminus y otras cosa. Fecha en 3 de septiembre de 1431, ante Martín Fernández de Logroño, escribano de esta ciudad.”; Gutiérrez Rodríguez, Oropesa y Los Álvarez de Toledo, 17. The king controlled the city council because he appointed its members, the corregidores.